More than 75 % of the people who received the survey with the sticky note request filled it out and returned it, whereas only 48 % of the second group and 36 % of the third group did so. 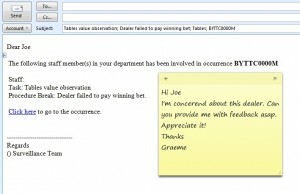 Garner suggests that people recognize the extra effort and personal touch that a handwritten sticky note requires, and they feel the need to reciprocate this personal touch by agreeing to the request. 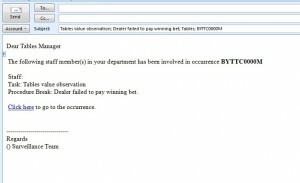 “Casino compliance should never be overlooked. Failing to keep up can mean failing to make money. Administrative tools help an organization protect itself from the damaging effects of negligence and fraud both by external sources and an organization’s own staff, by ensuring that policies and procedures are strictly followed.” iGaming Business Magazine (Dec 2008). 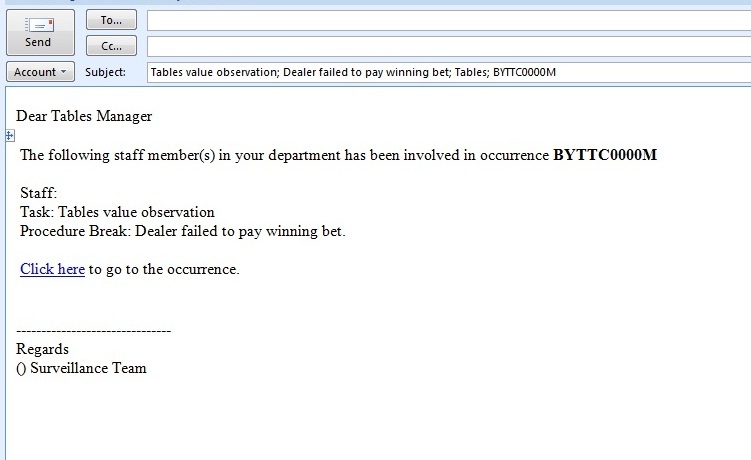 Below is an example of a compliance message that was automatically generated by cheeteye because of a casino procedure break. The image below is how that message will look in our new release that will be available soon i.e. it will give the manager an option to add a personal message. The system currently tracks all compliance messages that get sent and notifies the surveillance department of outstanding replies. 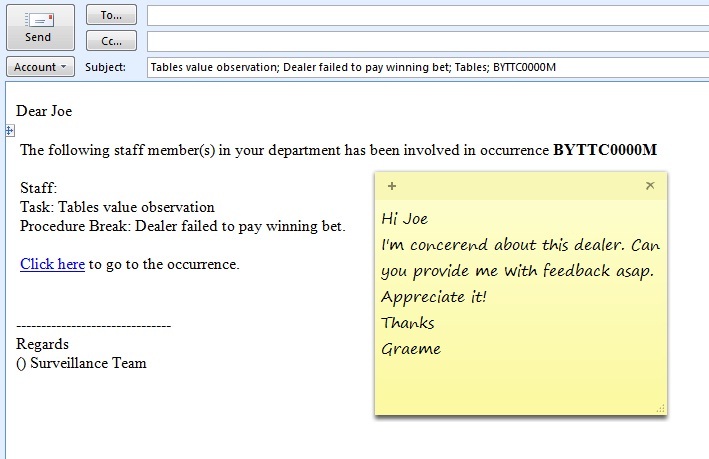 We’re hoping that with the personal “sticky note”, compliance awareness is going to be enhanced and surveillance departments will have another tool for creating a culture of casino compliance. According to Darrin Hoke in his chapter on innovation in “There’s no crying in surveillance”, “There are some analytics and dataveillance concepts floating around out there in our world, but they aren’t where they need to be yet.” According to wikipedia, innovation means to “renew or change”. Rather than wait for something to be where it is, make small changes to processes that are not working and you won’t fall behind when it comes to innovation. That’s what we’re doing with our clients and their surveillance department’s are smiling.